I fell in love with the first game and was thrilled to discover the sequels, this being the second of the series. The graphics are great. I like the international travel with the locations providing a little bit of cultural representation visually and musically. You can create your "own" recipes which isn't quite true (it's predetermined) but you have to figure out what ingredients to combine to create the chocolate treat so there is still the feeling of self creativity. The storyline continues from the first game a decade or two later. It's lots of fun and a great sequel. 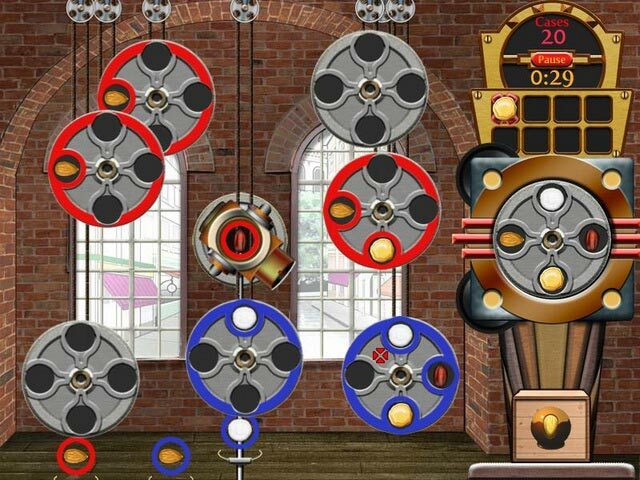 I play this lots of times and don't get bored. I love this game. It is fun, a challenge to play but what I love most about it is all the different recipes you can try with chocolate. Also, it is a challenge to pick the right recipes that will grow your business. Great game. So, this is an awesome sequal to the first Chocolatier! And it's not just a repeat of the first game. They've added the Chocolate Lab! Where you can create recipes. Again, it's not a short game. It takes a while to finish. Overall, an excellent game! The 2nd of the 3 Chocolatier games (not including the arcade-only time management one): Part adventure, part time management & strategy (though more resources management). Think "Lemonade Stand," the old game from 25 years ago! But with beautiful colors, interesting places to visit, and a great variety of chocolates to be made, with goals being updated constantly to continually challenge you. 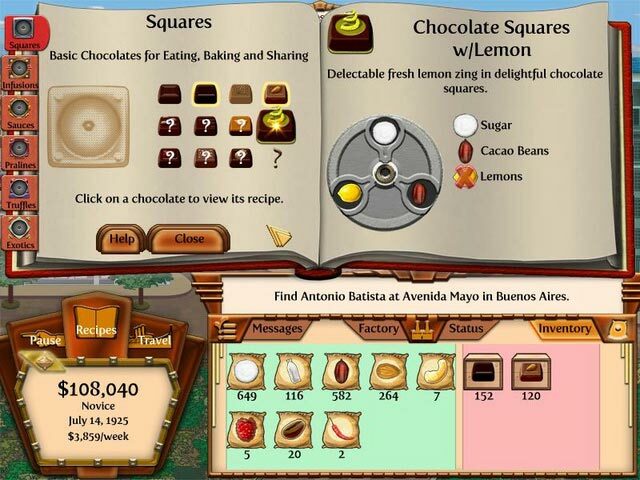 I have played all 3 Chocolatier games; I definitely recommend playing them in order, as the ingredients & recipes become more complicated as you go from game to game, and I expect most people will want to continue and play a sequel, so going in the reverse order might be a bit disappointing after the complexity of the later versions. Plus, chronologically, they go in order, and you get to see technology progress as well! Each one takes several hours to complete (longer if you don't quickly figure out how to handle your inventory or if you don't remember where to buy what or don't buy enough and have to make repetitive visits to the same locations). When you've completed all achievements you can keep playing if you wish, and there will be more custom orders given to you, just no more major achievements. No major video sequences or audio, but pleasing to look at. 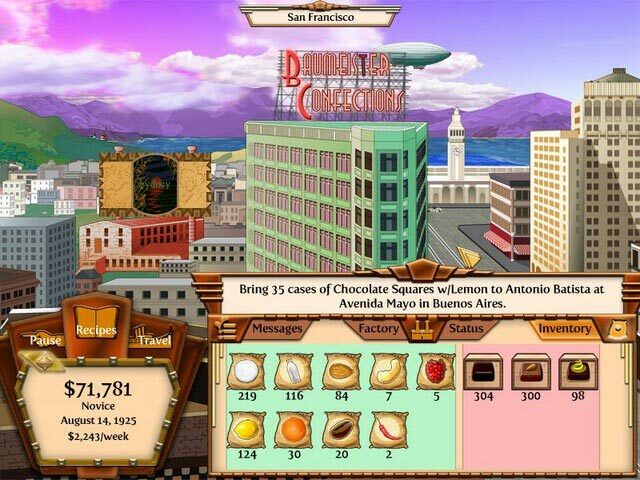 I like having the little arcade-style segments that determine your weekly chocolate output rates from each factory, and if you pay attention in your travels, you can learn the names of some new places and the important buildings in some of the cities! I eagerly await another game like this. My favorite part is that you get to use your own creativity deciding what ingredients to use for your own recipies. I wish there was more of that! The game puzzles were challenging but possible as well a fun! PLEASE MAKE ANOTHER! One of my favourite game of all times. There's not a lot of new things to say after reading others' reviews. All I can say is that this is one of the games that I return to time after time. Of the three Chocolatier games, this is the very best. Why? You only have one challenge to complete at a time; the graphics are great; your product inventory is easily seen; creating your new chocolates with the improved "minigame" machinery is different for each type of chocolate; and there's no time limit, eliminating that pesky clicking like crazy aspect to most TM games. The storyline plays into the game nicely by being part of some of the tasks. I don't have anything negative to say about the game, except that I would hope that there would be a fourth game of this type in the series. Highly recommend if you like to start at one location of a game, make/trade goods, and then off you go to different locations and progress through your chocolatier career! This game makes me crave chocolate! I always enjoy playing the Chocolatier series over and over again, but Chocolatier 2 is my favorite because of the secret ports and creating your own recipes! I spend hours visiting and revisiting ports to find out the current scoop from the locals.